-------- Note that M.Gemi in the Back Bay was a pop-up store and is no longer open! I will update when they open another shop in the area. Have you heard of M.Gemi? M.Gemi sells shoes; luxurious handcrafted shoes from Italy. You may have seen M.Gemi's beautiful shoes while scrolling through your Instagram feed. Or perhaps, browsed their styles while grabbing a treat from their traveling gelato truck last summer. For a company that first sold its shoes online only, M.Gemi hit the ground running promoting its brand and the opening of its stores in first New York City (Dec 2016) and later in Boston (July 2017). This Boston-based start-up was the idea of local serial entrepreneur Ben Fischman (his other ventures include Lids and Rue La La). The company started in 2015 and aims to disrupt the luxury business by making high-quality footwear available at a lower price point. 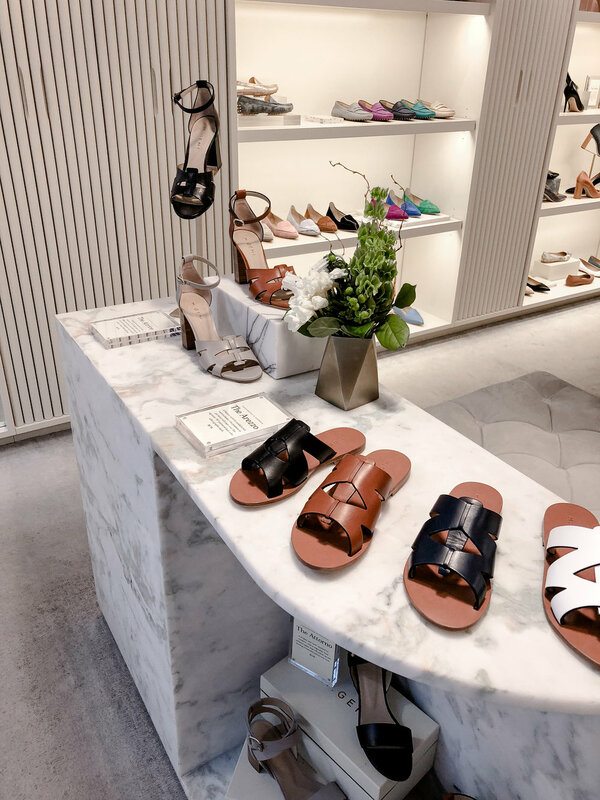 While other retailers are closing up their storefronts and concentrating sales online, M.Gemi tactfully uses its stores to get shoe lovers acquainted with its brand. Tactfully you say? Yes - first the company keeps a limited supply of shoes in its stores to help with fit and second after you decide on a pair, they order and ship it to you directly. There isn't anything to carry out of the store. I've been to the M.Gemi "fit store" several times at The Prudential Center (in Boston's Back Bay) since it opened. The modern storefront is sandwiched between Eataly and Canadian Goose, and located directly across from Sephora. It is small, has soft neutral decor, and overall pleasant boutique atmosphere. Photos of Italian architecture and landscapes adorn the tops of shelves. There are a few comfortable pale gray tufted benches to sit on while trying on shoes. When you try on shoes at M.Gemi, the focus is on fit. They carry each style in every shoe size but not in every color or finish. Their shoes are stored (and hidden!) in the various pull-out vertical shelves right in showroom (see photos below, the shelves are right where the orb-light fixtures are). I really liked this efficient set-up as sales associates don't have to disappear in the backroom for an unknown amount of time. On the display shelves, each pair of shoes has a cute Italian name, a fun description, and the price. These details are housed in modern acrylic frames by each style. Typically sandals, pumps, sneakers, and loafers range from $178 to $348. Booties or boots are a bit more but usually capped around $598. Most of the shoes on display are for woman. The men's section is limited to one shelf on the right, closest to the register counter and some shoes on a center display. The brand's "approachability" - I've walked into countless high-end stores/department stores and have at times been made to feel uncomfortable. Sometimes stores feel cold and their people indifferent. Never have I felt that way at M.Gemi in store or talking to reps online. Their team is always kind, patient, and enthusiastic. Value - The company makes high quality shoes at an attainable price point. The shoes themselves feel substantial, the foot beds are cushioned, and seams are clean and finished. The shoes flex and contour to your feet over time without compromising the structural integrity (even after many wears). The price is very fair, and noticeably lower than other Italian brands. Company is data-driven - As someone who works in analytics, this is extremely meaningful. M.Gemi company that actively collects and actively uses data to make a better shopping experience is crucial. For example, when you shop in store M.Gemi will log what styles you tried on vs. what you bought. My time is important and so is your time. So if a company is more Amazon-like and brings you what you need/like to you, that is a win. I'm always able to get the assistance an M.Gemi associates when shopping in store. They're helpful and non-pushy. During my latest visit, I tried on the The Lustro (suede 90mm pumps with a block heel) and The Felize (suede loafers with rubber peg soles). Both pairs of shoes were beautiful and comfortable. But since I needed some walkable shoes, I was much more drawn to the loafers. Plus, the bright magenta color was eye-catching and would be refreshing for spring. Unfortunately, they didn't have that particular color in my size so I tried on The Felize in lilac. This pair of shoes are reminiscent of the well-known Tod loafers (which I've also tried). The M.Gemi felt softer and fit better. I have long and narrow feet so I've often found that most shoes are loose on me. However, these were just the right "snugness" and plush insole would mold nicely to my feet over time. I was a little apprehensive about maintaining the suede exterior and guessing how the rubber peg soles would wear over time. But I figured that I wouldn't know if I didn't actually try. So I ordered a pair in magenta. Check out was easy and done on a tablet. This will be my second purchase from the company. It always arrives in the most beautiful box, dust bag, and there is a card with your name handwritten on it. Can't wait to get my shoes! M.Gemi has one Boston location at The Prudential Shops at 800 Bolyston Street (pictured here) and one New York City location at 120 Wooster Street in Soho.